Note from Jess: This post is by Storie Stinger Johnson. Storie shares such an incredible truth here. Notice the advice she gives to those who are at their lowest points. It sounds like the exact same guidance we get at church week after week. So profound, so beautiful, and so true! Thanks for sharing Storie! I love my job. I help empower people who have been given a less than ideal situation in life. I help people who have been abused, who starve, who don't have a place to call home, people who struggle to find jobs, people who are ostracized and shunned from the majority of the population. I am a social worker. I have worked in agencies that deal with some of the lowest, harshest, darkest and downright scariest situations that life can deal out. I have worked with drug addicts, the chronically mentally ill, physically and mentally disabled, teens who were abused in every way possible known to man, the rich and poor, the young and old, every race, color and ethnicity. I have not seen or dealt with it all, but I have seen and dealt with more than the average person. From all of the people, situations and environments that I have experienced I have learned one very important and universal truth- It has been the harshest environments of my life that I have been able to do the most good. These populations of people are misunderstood, hated and shunned, but they are God’s children too. They need help, love and support just like the rest of us. God is aware of their situations and he has placed people like you and me into their lives to help them up, help them heal, and be their friends. While working in a drug rehabilitation facility working with a client who was really struggling trying to reconnect with God in her life again. She has just lost her pharmaceutical license for using drugs and she was drowning in her own sea of despair. She was diving into the Bible trying to find something to grasp from, and I grabbed a Book of Mormon and shared two verses from it with her to supplement what she was reading in the Bible. She thanked me and took the Book of Mormon with her back to her room. Another client in the same facility was struggling with finding any hope in her life. She had begun praying again but was struggling to get anything from it. After asking her how she was praying I mentioned that she could try kneeling on her knees and praying out loud. The next day after trying that she reported that it was a way more powerful experience, and that it had brought her some needed peace. While working in an adult psychiatric facility I had a client who experienced severe psychotic episodes caused by brain damage from drug use. She would come in and out of lucidity upset and confused on why she couldn’t “keep it together” or be lucid all the time. During one of these precious moments of lucidity she asked me if she would ever see her daughter again. Truthfully I didn’t know the answer, I had no idea if she would see her daughter again and I could not fill her with a false hope. I could feel God’s intense love for her at that moment and did my best to express that to her. I didn’t tell her that she would see her daughter again, but I did comfort her and remind her that she was loved and not forgotten in her time of despair and need. The bottom line is that I don’t know the long term outcomes from those experiences. I don’t know how much a difference it made for them in the long run, but I do know that in that moment it meant the world to them, and it made a lasting impression on me. So some of you may be thinking "I am not in those kinds of situations, I am just an average person doing average stuff." but I am here to tell to say, "You are in the right place at the right time to help the people around you." Just because the people in this post were literally in their lowest of lows I would have done the exact same thing with one of my friends who was having a bad day. The love and help we give to others should be universal. Everyone around us is struggling with something, literally EVERYONE, and even though their situation might not seem 'harsh' to us at that moment it might be for them. Don't wait for disastrous moments in others lives to help out. 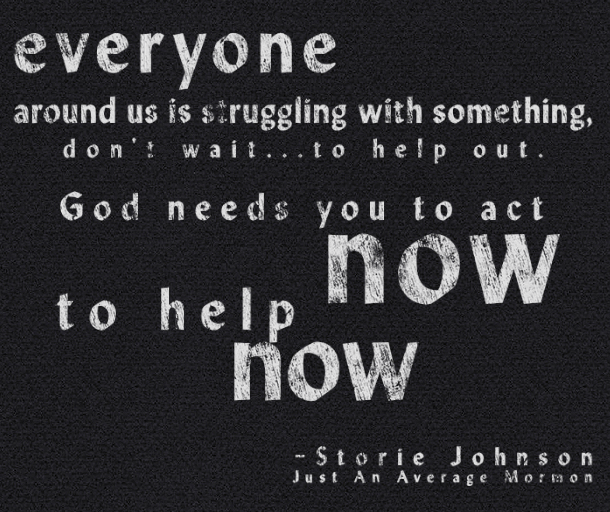 God needs you to act now, to help now. I know that God lives and completely understands and comprehends our lives and the lives of the people around us. When you trust God to place you in the right situations He will then entrust you with the power and strength to do the right thing. One might be urged to stay away from the situations and environments in our lives that make us uncomfortable, those experiences that truly test our Christianity, but I know that it is in these environments that we make the biggest impacts and do the most good. I am not saying to go out looking for trouble or hard people or experiences that could put you in danger, all I am saying is that we all have things or people in our lives that are harsher than others, and that is where you are needed the most. I know that God has placed us in those environments to be tools in his hands to help his children. I testify that it is in the harshest environments in our lives that we can do the most good.